Click on the group you want to copy an existing group into. For this example, the 1st team will be opened. Or, create a new group (discussed in "Adding a Group"). 3. In the Athletes section any existing athletes in that group will appear. 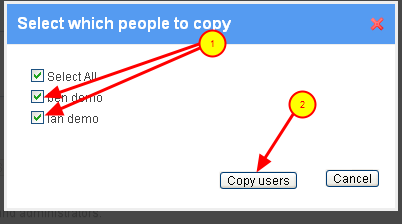 Click on "Copy From Group"
1. Click on the drop down arrow and select the group you want to copy the athletes from. The athletes will now also appear in this group, e.g the chosen athletes from the testing group will now appear in the Team 1 Athletes section. You can select to copy in additional athletes from other groups if required.